This picture is one of my favorites of my wedding day. Papi and I share an affectionate moment, something that rarely happened. On that cold Miami winter day, Papi set foot inside a church since he’d left the priesthood, over twenty-five years before. He also wore a tuxedo for the first time ever, something he abhorred. He laughed and joked, reveling with family and friends. It was a departure from his earlier, more sullen self. Today, he’d be celebrating his 83rd birthday. Time’s crazy like that–it whizzes by at dizzying speed, leaving us wondering, how did that happen? 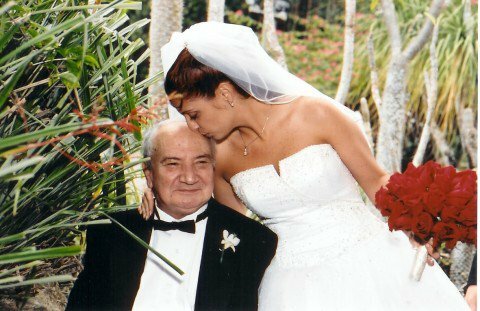 Happy birthday, Papi, wherever you are.